While the house I gazed upon some while earlier was a monument to the business acumen and entrepreneurial skills of the Smiths, the next estate, Medmenham Abbey, could not have a more different history. The original Cistercian Abbey was founded in the 12th century and recognised by Royal Charter in 1200. It appears to have been a quiet place during its monastic existence (as these places were meant to be) until it was dissolved in 1547. It then passed through different family ownership until 1755, when all hell was let loose. To be precise “Hellfire” was let loose. 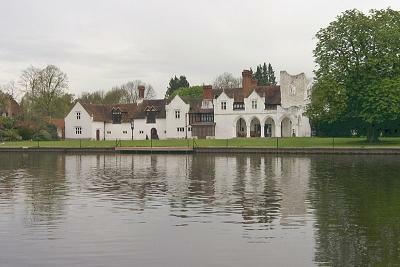 Medmenham Abbey became the headquarters of the notorious “Hellfire Club”. The club was founded in 1749 by Sir Francis Dashwood, and was one of many similar groups around the country. They attracted certain characters who we would mostly today refer to as “Hooray Henries” and enjoyed a reputation for drunkenness and debauchery. They were alleged to hold mock religious ceremonies and wear extravagant costumes and masks to conceal their identities when engaged in some of their more colourful proclivities. The exact activities of the club have never been established beyond the confines of rumour and vivid imagination. Many of the Hellfire members were involved in politics and the membership allegedly included John Montague the Earl of Sandwich, William Hogarth, the Earl of Bute and the Prince of Wales. Benjamin Franklin was also a great friend of Dashwood and in all probability also took part in some of the sessions. Eventually the Abbey became too notorious even for the Hellfire members, and Dashwood moved his club to the caves of West Wycombe that he had dug out for this very purpose. The caves are still there now, but I must push on and leave this den of iniquity behind.